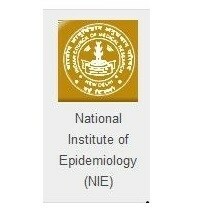 NIE Jobs Recruitment Notification 2019.National Institute of Epidemiology (NIE) inviting applications for the positions of Scientist-C, Technical Officer.Interested and Eligible candidates can apply for the positions. Scientist-C (Medical/Non-Medical) – Post Graduate Degree (MD/DNB) in Community Medicine/Preventive & Social Medicine/Public Health/Community Health/Epidemiology after MBBS degree recognized by MCI, with one year experience. Senior Investigator– Graduate in Life Science/Social science subjects from a recognized university with five years of work experience from a recognized institution. Technical Officer A (Data Manager) – Bachelor’s Degree in Statistics/Biostatistics from a recognized University with 5 years experience from a recognized Institute. Selected candidates will get Rs.17,000/- to Rs.64000/- from the organization. Interested and eligible candidates may attend the Walk-in interview at below venue along with Application Form which is available at official website nie.gov.in on 08th, 22nd, 23rd, 24th, 25th, 26th & 29th Apr 2019. Contenders who are attending for Walk-in-interview needs to bring Original Certificates along with Xerox Copies.